CPS member Ottar L. Osen was vital in initiating TEFT, a 20 MNOK research and development project related to service innovation, entrepreneurship, finance, and technology (“tjenesteinnovasjon, entreprenørskap, finans og teknologi”) sponsored by Sparebanken Møre and executed in cooperation between the Department of International Business (IIF) and the Department of ICT and Natural Sciences (IIR). The project will be grounded in the NTNU-Sparebanken Møre TEFT Lab (TEFT Lab), headed by professor Øivind Strand at IIF. CPS member Ibrahim A. Hameed, who is also the head of the Digital Transformation Lab, supervises several of the PhD students involved in TEFT. 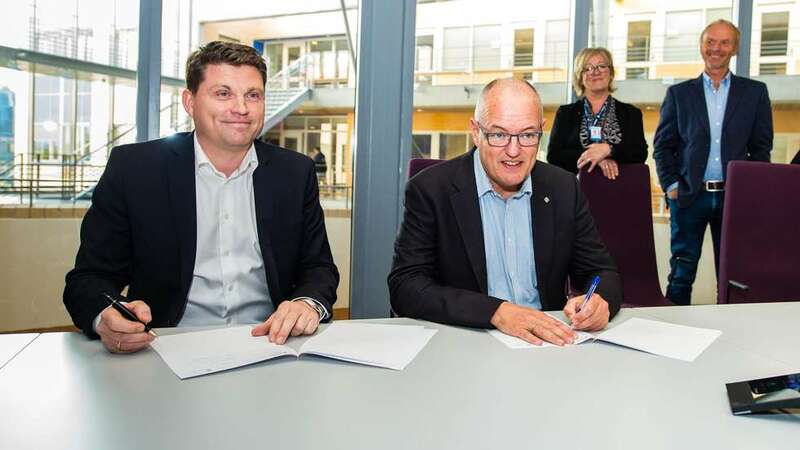 Contract being signed by Trond Lars Nydal, Sparebanken Møre and Gunnar Bovim, NTNU rector, on 27 September 2017. Through the TEFT Lab, several new professorships and doctoral students at NTNU in Ålesund will build knowledge in areas such as AI, machine learning, data analytics, and sustainable business models. Sparebanken Møre will contribute not only financially but also with domain expertise.